Welcome to Summer at Kaiteriteri. Summer is now upon us and all the forecasts from Tourism New Zealand and other agencies concerning increased numbers of international and domestic tourists to the region are proving very accurate and it is shaping up to be the biggest season in our history. There is certainly significant demand which is very exciting and reinforces that as a destination our focus must be on service, staff, assets, infrastructure and partnerships. There has been a lot of work throughout the last few years to improve our offer with major investment into recruitment, our new premium apartments, new store, conference facilities, Newbook booking software, website, information technology, Wi-Fi, health & safety, NPD petrol station and of course the world class Kaiteriteri Mountain Bike Park. This is the start of our plan to enhance Kaiteriteri in an appropriate and sustainable way. Next steps include addressing parking capacity, Shoreline Restaurant, improving the estuary as a conservation - recreation resource and improving the connection between the bike park and the beach. Our partners on the Reserve offer water taxi, cruise, kayaking, waka, mountain bike and eco tour experiences. Despite the welcomed growth in international tourism, New Zealand families will always be part of the fabric of Kaiteriteri. 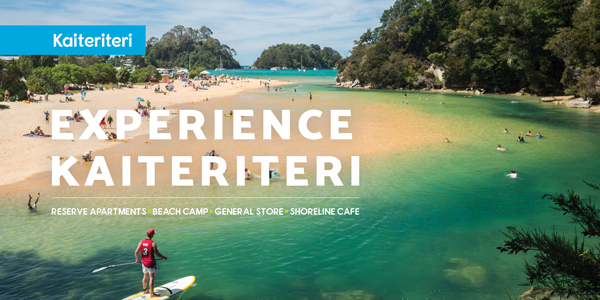 Our vision is simply that Kaiteriteri will be the best coastal outdoor recreation destination in New Zealand.